Don't let Harry succumb to rattlesnakes and scorpions. Just consult this helpful wilderness guide. By all accounts, Indiana Jones and the Kingdom of the Crystal Skull was disappointing, to say the least, largely because the death defying, whip-cracking archaeologist looked, well, old. Thankfully, we can't say the same about Pitfall Harry, star of the 1982 Atari 2600 Pitfall! adventure. 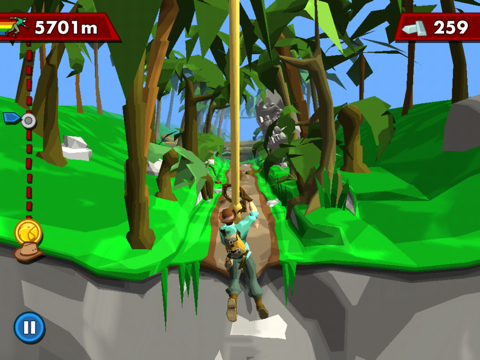 Thirty years later, he's still going strong in the re-imagined iPhone and iPad game, Pitfall!, an endless runner full of man-eating crocodiles, poisonous rattlesnakes and other hazards. 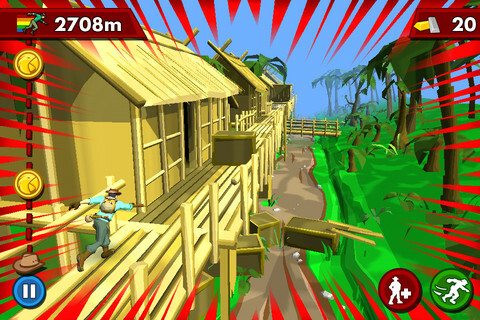 As usual, the jungle can be a dangerous place, and to help keep you forging ahead, we put together this Pitfall! cheats and tips guide. As you'll soon learn, these precious stones are tough to come by. That is, unless you open your wallet. Transforms all silver bars into gold, worth twice as much. 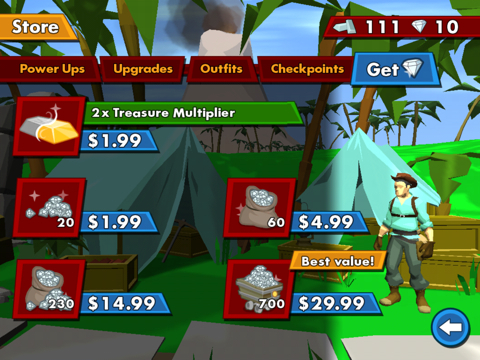 Steer clear of poisonous snakes and other dangers by forking over some treasure to buy the following power-ups. 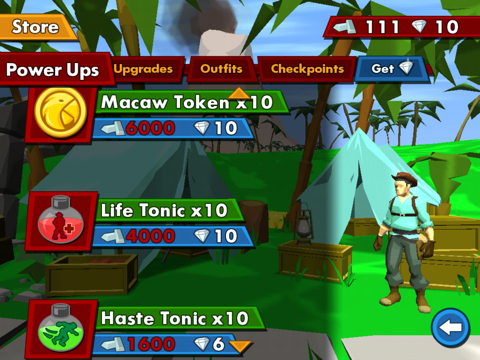 Macaw Token x 10 (6,000 treasure pieces or 10 diamonds): Macaw Tokens allow Harry to start running from Checkpoints you have activated. Life Tonic x10 (4,000 treasure pieces of 10 diamonds): Life Tonics last a short amount of time, and will immediately revive Harry if he dies. Haste Tonic x10 (1,600 treasure pieces or six diamonds): Drinking a Haste Tonic will boost Harry's running speed for a short amount of time. Anti-Venom Tonic x10 (3,000 treasure pieces, eight diamonds): Anti-Venom Tonics will instantly cure Harry of the ill effects of any bites and stings. These life-saving items should keep Harry among the living. Even better, you can upgrade them up to three times each, but beware. The prices increase with each upgrade. On the positive side, so do the abilities. For example, upgrading the Jaguar Token lets you buy another that results in the animal automatically collecting treasure within range. 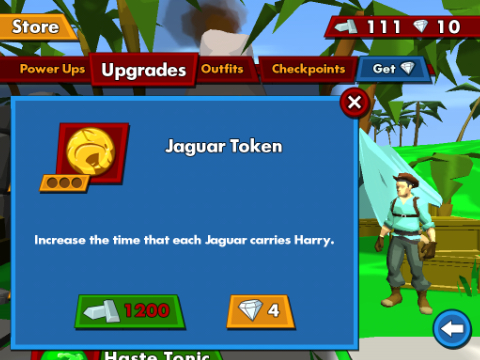 Jaguar Token (1,200 treasure pieces, four diamonds): Increase the time that each Jaguar carries Harry. Life Tonic (2,800 treasure pieces, eight diamonds): Life Tonics will protect Harry for longer. Haste Tonic (1,200 treasure pieces, four diamonds): Increase the duration of Haste Tonics. 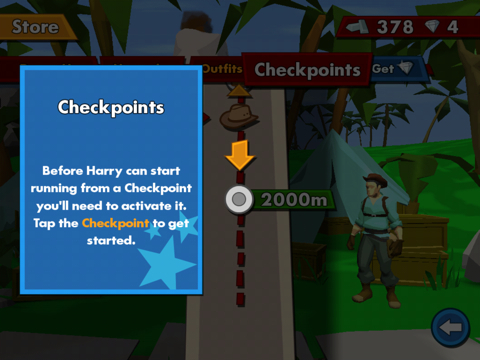 Resistance (1,200 treasure pieces, four diamonds): Decrease the time that Harry remains affected by bites and stings. Curious to know how close you are to earning a new badge? Head to the Explorer's Club, where you'll find percentages on activated achievements, from collecting 5,000 pieces of treasure to eliminating 200 snakes. 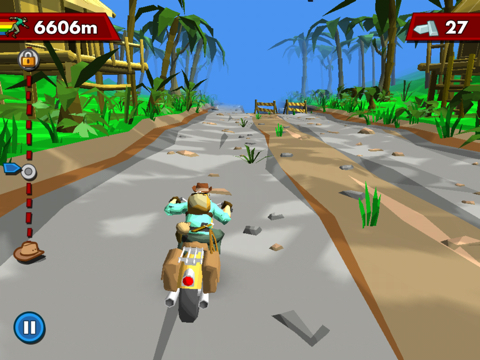 If you see a bunch of logs roll across the path, don't swipe up thinking you can jump those suckers while on the bike. Instead, you'll get a mouthful of wood, so to speak. 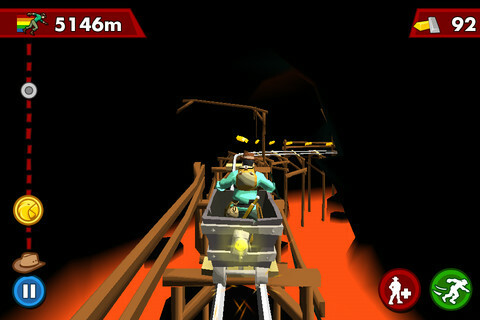 Same holds true with the mine cart, minus the wood. Harry can withstand one bite from a rattlesnake and/or scorpion, but not two. If he gets bitten once, red daggers appear around the edges of the screen, letting you know he's poisoned. One more bite, and it's curtains for this weary adventurer. That said, always use Harry's whip (tap the screen) to make short work of these critters. Put simply, arrows instruct you to switch tracks by swiping left or right. If the track looks broken, swipe in the opposite direction of the break to grind along the rail. Having trouble clearing spikes or a bed of lava? Try swiping up to jump right as Harry reaches the edge. This mostly applies to skinny tree trunks blocking the path, and small bridges. Don't try jumping over a wall. Just because you reach a checkpoint doesn't mean you'll immediately start running from that location. You must head to the Store, then the Checkpoints section. Keep in mind that you need diamonds to activate checkpoints, and Macaw Tokens to start from checkpoints. 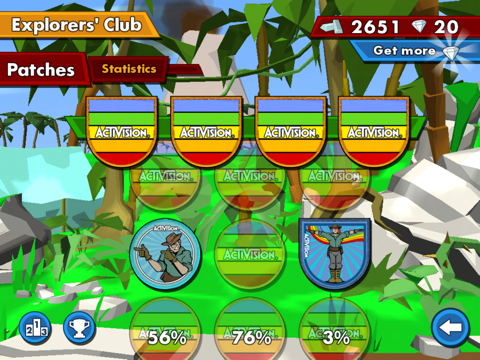 Brag about Pitfall! on Facebook to obtain free loot. You can also do this by rating the game on the App Store.